A Southeast Alaska tribal government hopes to leverage a federal law to secure the return of human remains and burial objects removed from a remote cave more than 50 years ago. The Organized Village of Kake seeks to bring back a mummified infant and other items taken in 1961 from a cave on Entrance Island near Hobart Bay, about 70 miles south of Juneau. “Any items we can get back to the community we’re welcoming back, whether it be human remains or artifacts,” Frank Hughes said. The identities of the people who took the culturally significant items — now in museums and private collections — are unknown. The Native American Graves Protection and Repatriation Act, or NAGPRA, requires publishing a notice in the federal register of the intent to return the items. If no one else comes forward to object, the remains and burial items can be repatriated. The law also provides funding to identify items and return them to Alaska Native tribes and other indigenous peoples. The infant, 6-9 months in age, was buried inside a painted bentwood box. The remains have been at the Alaska State Libraries, Archives and Museum since 1961 and the museum doesn’t know their age, but they could date back to first contact with people from outside the area. Another four burial items from Entrance Island resurfaced just last year, when an unnamed individual from California approached the U.S. Forest Service in 2017 with the intent on returning them. The Organized Village of Kake also is working to recover other items too. A shaman’s jawbone was taken sometime before 1910 and now at a museum in St. Joseph, Missouri. Other artifacts have been found in Portland, Oregon and at George Fox University in Newberg, Oregon. Hughes notes that Tlingit protocol on who is allowed to handle remains and artifacts is even stricter than federal law. He said non-burial artifacts could eventually be put on display in Kake, if they are successfully returned. “We always look forward to bringing them back,” said Hughes. the NAGPRA coordinator for Organized Village of Kake. Hughes said the tribal government’s intention is to bury these items, just as they were. While Hughes thinks it best to return the infant body to its original burial site, he said that will ultimately depend on the recommendation of Kake’s repatriation committee in consultation with the involved clan. Repatriating human remains and culturally sensitive artifacts is a process that can take time. The Entrance Island site is located on what is now national forest land. Forest Service determines what tribes had traditional claim to the territory when repatriations take place. 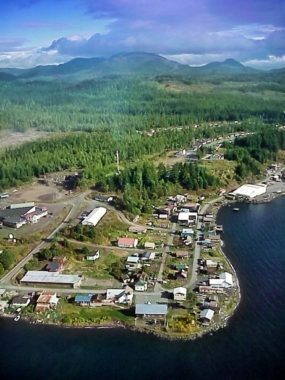 Entrance Island site is within the traditional territory of the Kake people despite being a long way from the current day location of Kake, a community of about 600 people in central Southeast Alaska. This kind removal of items from burial sites was pretty common before NAGPRA, Thibault said. “They came into the museum long before I was around but there’s no record of them ever being on display,” said Steve Henrikson, the curator of collections at the Alaska State Archives, and Museum. “They were taken in and put into storage,” he added. It was common for people to give collected artifacts to the museum, Henrikson said. Henrikson said the tribe is in the driver’s seat now, in terms of when and how the items are returned.